All photos courtesy of NationalAirTour.org unless otherwise indicated. 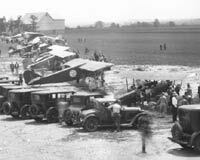 The National Air Tour at Pitcairn Field near Bryn Athen, PA, on July 1, 1927. 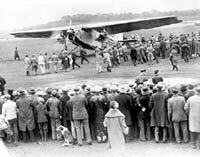 Crowds watching a Ford 4-AT Tri-motor in Boston during the 1927 National Air Tour. 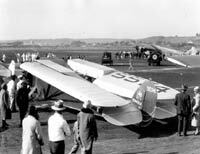 A Ford Tri-motor, the first go participate in the National Air Tour, taxis on the ground in Wichita, KS, during the 1927 tour. 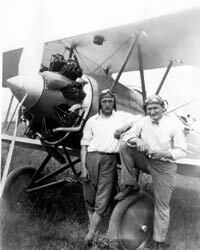 Walter Beech and Brice Goldsborough in front of the Pioneer Instruments Travel Air 4000 in which they won the 1926 National Air Tour. A Fairchild FC-2 from the 1928 National Air Tour demonstrating its folding wings, an advantage in the early days before aircraft hangars. Flown in the tour by R.W. Pears.